M2 mooring deployment off the NOAA Ship Oscar Dyson. 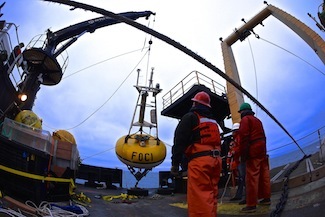 PMEL and Alaska Fisheries Science Center’s EcoFOCI program just deployed the M2 mooring in the southeastern Bering Sea for the 20th consecutive year. The mooring has been providing year-round measurements of temperature, salinity, nitrite, chlorophyll, and currents in this highly productive area since 1994. These measurements are used in annual report cards and stock assessments provided to the North Pacific Fishery Management Council. Long-term time-series at this site are a critical tool for adapting to climate change and guiding sustainable management of living resources in the Bering Sea. Visit the EcoFOCI website for more information on their work in the Bering Sea, Gulf of Alaska, and Arctic waters.